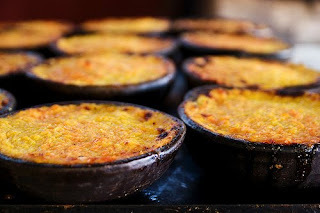 Choclo is an indigenous word for corn that they say in Chile (thats where I served my mission). "Pastel de choco" is literally corn dessert. This is an entree dish, but it's called that because the corn is sweetened with sugar. The dish has seasoned ground beef and chicken, sliced boiled eggs, and is topped with a sweet corn pudding. It sounds pretty wild, but trust me, it's delicious. You could do just one meat if you want, but everything goes together suprisingly well. This makes a lot. For the fresh, raw corn: cut kernels off of core using a sharp knife, then blend adding a little milk if needed. Heat the corn, 2 raw eggs, and butter in a large pot. Season with oregano, salt, pepper, and sugar. Add the milk and corn meal (if using fresh corn, corn meal probably isn’t necessary) little by little, stir constant until the mixture thickens (it should be kinda like pudding, maybe slightly less thick). Cook over low heat 5 min. Set aside while preparing the meat filling. Pound chicken and sprinkle with garlic salt, pepper, paprika, and cumin. Fry in olive oil, a few minutes on each side until cooked through. Cut up in 1" pieces and set aside. Brown meat and onions. Add garlic, salt, pepper, cumin, chili powder, paprika, additional oregano, a couple pinches coriander, and a pinch of red pepper flakes to season. Cook a couple more minutes then pack the meat mixture into a casserole dish sprayed with pam (or you can do individual serving dishes like you would with pot pie). Arrange the hardboiled egg slices, then chicken on top of the meat. Cover the filling with the corn mixture. Sprinkle additional sugar over the top. Bake at 400° for 30-35 minutes until the crust is golden brown. I do have a couple things you probably don't have to make this dish, but that's okay because they aren't necessary. 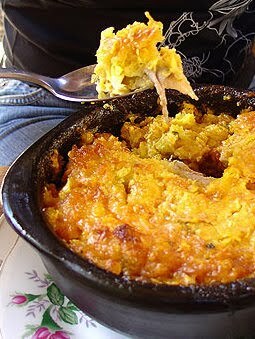 This was my very fist time trying pastel de choclo in the states. It tasted good, but I was still figuring out the right texture for the corn.